Bengalivo Secret Clouds aka Rain is a daughter out of the last litter of Thunder. She is very dark coloured so expect that she will carry for melanistic. She is very lovely, likes attention and is not afraid of anything. 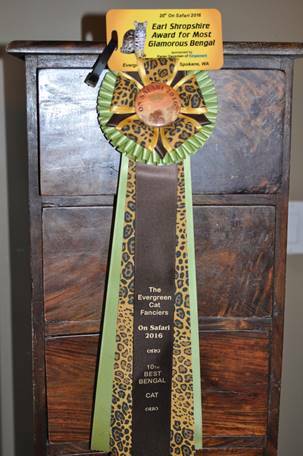 Rain attended the On Safari Show (Spokane USA) and became Breeders Choice Most Glamorous Bengal; so proud of her !